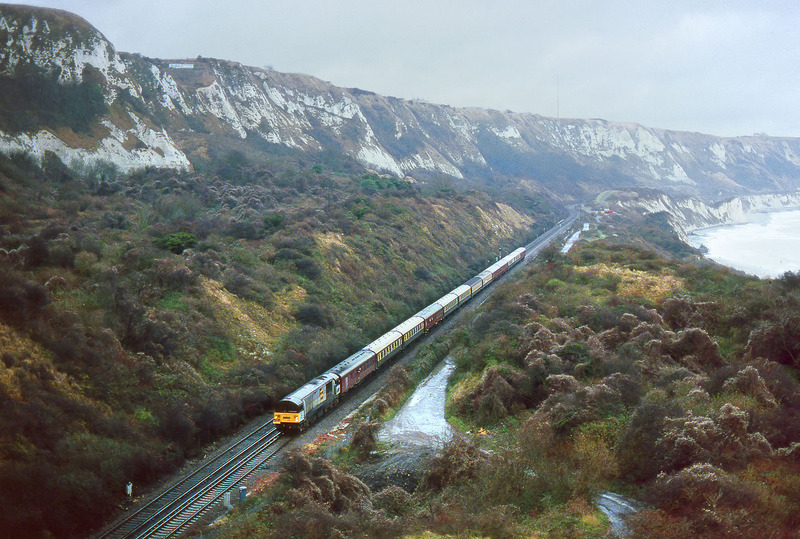 58042 Ironbridge Power Station passes through the dramatic landscape of Folkestone Warren on 21 December 1991 with the Hertfordshire Railtours 1Z36 'Man of Kent' railtour. This was a circular tour of Kent, starting from St Pancras at 08:45, and visiting Faversham, Ramsgate, Sandwich, Dover and Tonbridge. Unfortunately it was an extremely dull and windy day, with plenty of rain. Perhaps that explains why there was only one other photographer at this spot, despite the unprecedented sight of a Class 58 on a passenger train in Kent!